BJP president Amit Shah wants to enter the Lok Sabha because that would be the first step towards his recognition as a mass leader. Amit Shah’s decision last week to contest from Gandhinagar Lok Sabha seat, currently held by BJP patriarch LK Advani, is the clearest statement yet of his ambitions: He is a potential mass leader and not a mere poll strategist or political mastermind. And he must settle the issue of succession when he pulls the strings. Contesting the Lok Sabha election is not about becoming the next home minister as many in political circles believe. First, the former Gujarat home minister still has four-and-a-half years left in his current Rajya Sabha term. Second, being an Upper House member is hardly a negative attribute in an aspiring minister, given that 11 of the 25 members in Narendra Modi’s Cabinet are from the Rajya Sabha. So strong is the hunch among his party colleagues about Amit Shah finally joining the Modi government — as ‘Vajpayee’s Advani’ — that they don’t see him seeking another term as BJP president. He completed his first term as party chief in January this year but organisational elections have been deferred until after the Lok Sabha elections. He had assumed the party chief’s role in July 2014 for the remainder of the tenure (until January 2016) of then party president Rajnath Singh, who joined the government as the Union home minister. So, it would be quite a coincidence if Amit Shah steps into Rajnath Singh’s new shoes in 2019 — that is, of course, if the BJP returns to power. Amit Shah wants to enter the Lok Sabha because that would be the first step towards his recognition as a mass leader. In the run-up to and during the April-May elections, Prime Minister Narendra Modi is expected to address 150 to 200 rallies; the number is pegged at over 250 in Amit Shah’s case. For those contesting on BJP tickets, Modi remains the first choice and Shah a close second. As the prime minister can’t spare so much time, the BJP president would end up addressing more rallies. And, unlike Congress candidates who feel obliged and compelled to organise the meetings of top leaders in their constituencies, their BJP counterparts are desperate to get Modi’s or Shah’s consent to address their voters. There is no doubt about Amit Shah’s appeal among BJP workers. He gets them on fire when he starts speaking. His speeches have started drawing applause from common people, too. In India, where there is a dearth of good orators, Narendra Modi obviously stands out. But Amit Shah is also emerging as an orator in his own right — not just because of the provocative content in his speech but also because of his style of delivery that is marked by conviction, firmness and a chilling clarity of purpose. Amit Shah has been closely associated with Narendra Modi since his early days of evolution and transformation from a low-profile RSS leader to a Hindu Hriday Samrat who could hypnotise voters. If somebody really knows what it takes to become Modi, it is Amit Shah. And if Modi has to trust one person with his life today, it would be Amit Shah. Shah’s entry in the government will also be the first step towards putting in place a succession plan in the saffron party. 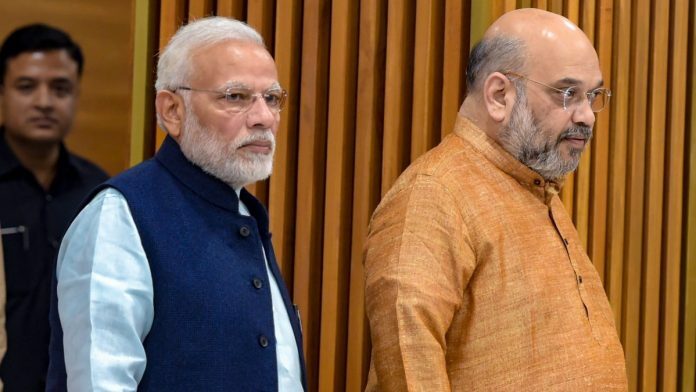 By 2024 general elections, Modi will be well over 73 years and may not be inclined to seek another term, going by the standards he and Shah are setting for septuagenarians in the BJP. Make no mistake: Shah’s likely entry in the Lok Sabha coming May is meant to lay the ground for transition of power five years later. Those who know Amit Shah would tell you he would definitely not like to be a log in the water or else he would control its flow. There was a lot of heartburn in the BJP after this interview. You have to give it to Shah — today you may have more leaders in the BJP supporting Amit Shah’s elevation than those in the Congress backing Rahul Gandhi’s prime ministership. There is a caveat, though. The succession plan in the BJP must hinge on the assumption that the BJP will return to power in May. Prime Minister Narendra Modi is very confident, of course. At the BJP’s Central Election Committee’s meetings to finalise party candidates for the Lok Sabha elections, Modi had just one question to the leaders coming from other states: “Surgical strikes (mind you, not air) ka kya impact hai?” “It’s great. The entire northeast is bam-bam (in raptures),” responded a leader from the northeast. Modi laughed heartily every time a state leader gave such answers. Amit Shah must have reasons to make his next move and enter the Lok Sabha. Who knows what L.K. Advani would have been today had Atal Bihari Vajpayee got a renewed mandate in 2004. It will be a BAD CHOICE for BJP and India if Amit Shah is Modi’s designated successor. Shah has proven his fraility through business dealing and side deals on land in Gujarat and also now in Delhi where he has let the money be amassed by his son. Going from ‘ small potatoes” to a sizable amount in short period of a few years is not only astounding but reeks of the Vadra story! He is too blunt not too polished and pretty much a nuts and bolts kind of man rather than a visionary leader who can overlook nitpicking and look to shape and build India’s future. Bad if this report is to be believed! Yogi–fadnavis . Shah will always b a party man though he may hold important ministry. Gujarat is the new Uttar Pradesh. It is fun to be a journalist. You can create a write based entirely on speculation or on conjuncture. You can predict anything you want. And finally after the event is over, you can write an article explaining why it has happened, with no apologies, even if the initial forecast was incorrect. The best part is that you even get paid for all this. It’s too early to predict succession plan for 2024. Even otherwise he is more powerful than any cabinet minister and virtually Dy.PM.